Young People Changing The World is a weekly series featuring the world's changemakers. Every Monday, I publish an interview with a young entrepreneur with questions regarding their journey. They tell us their definition of success, their desired impact on the world and share their single most important lesson. My goal with this series is to inspire young leaders to take action. Be bold. Go after your dreams. Make a positive change in the world. Salina Siu is a wonder woman who has done it all. She is the craftster behind Salinabear, a Youtube channel with over 12 million views, teaching girls how to be creative and design their own clothes. She has worked in social media with big names such as SAP and Invoke Media (makers of Hootsuite). She started her own lifestyle and fashion magazine. Most recently, she co-founded OMG Social Media Conference, an event aimed at simplifying social media for small businesses. I'm fortunate to call Salina a friend. We first met four years ago, and I've always been in awe of her entrepreneurial attitude and creative ideas. We met in university, while we were involved in our school's chapter of AIESEC, the world's largest student-run organization. Together, we worked on the Executive Board, where I had the chance to get to know her and her work. Since then, we worked tirelessly on OMG Social Media Conference. 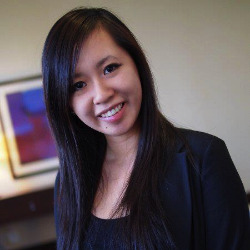 She and co-founder Lesley Yuen pushed our team of 7 to our boundaries. There were some doubts when we first started. Would anyone go to a conference organized by some young 20-somethings? Would we sell enough tickets? In the end, the conference was a success. It's evidence that roadblocks can be overcome if you believe in your vision, just like Salina and Lesley did. Salina is exactly the kind of person who chases after her crazy dreams, and I'm excited to share my interview with her. I graduated from Simon Fraser University in Vancouver last summer with a Bachelor of Business Administration in marketing and entrepreneurship with a minor in publishing. Then I worked at SAP, one of the largest software enterprise companies in the world on an 8 month contract doing social media marketing for their analytics softwares. At the same time, I had become the co-founder of a conference and my team and I spent a year organizing, OMG Social Media Conference. It just happened on August 15, 2013 and had over 100 local small business owners learning tangible takeaways to implement social media into their marketing strategy. I recently just traveled to Dominican Republic, Mexico and Hawaii for some amazing relaxation during my "funemployement" and now I'm doing social media freelancing and working on my Salinabear YouTube channel! Where did the idea of your organization come from? I bought a t-shirt that was cut up from the mall. I loved it and really wanted to know how they did it so I started googling, "how to cut t-shirts" and watched every video out there. I found the videos confusing but once I realized cutting t-shirts was easier than it looks, I decided to create my own videos to help others learn it more easily! If I have a career that gives me financial freedom, flexibility to have a family, provides me with a creative outlet, inspires and helps others, as well as makes me happy, then I'd consider that a slam dunk! How do you want to make an impact on the world? Right now, I love inspiring young girls around the world to be creative and learning to cut t-shirts! The ability to share knowledge with the world is really important to me. No idea is new anymore. Everything is a variation of something or a combination of other things. I find my ideas from everything around me. When you're passionate about something, it's always on your mind so it's easier to spot inspiration in places you wouldn't expect. You just need the vision to see it apply from one form to another. How do you keep yourself aligned to your goals? Whenever I get demotivated, I always start self-reflecting. If I'm not feeling it, I want to know why. Is it really what I want? Am I spending too much time on something? Are things not what I expected it to be? Then I reassess and refresh my goals. List one person you admire, and why? One person I admire: Erica Domesek, the creator of the brand, P.S. I Made This because she has made an amazing career out of craft tutorials. Similar to my Salinabear YouTube goals, she has been featured in the biggest magazines, published books, created craft workshops with high end clothing brands and grown an enormous following. She lives a life of crafting and fashion and it sounds amazing! As a young leader, what is the single activity or habit you do, that you recommend everyone else does? Learn how to keep your email inbox organized. It will only get worse so get a handle on it now! I archive or delete everything and keep my inbox to less than 20 emails at all times. The emails that you do leave in your inbox should all be pending action - you need to reply them, you're waiting for their response, etc. This way, you'll never lose an important email in the barrage of new messages you get every day. Which tools, apps or resources do you live by? Something interesting about me: I love terrible reality TV. I know I shouldn't - it's turning my brain into mush but I can't stop! What is the single most important lesson you can share with our readers? Having a quarter life crisis is awesome because it makes you question everything. The Young People Changing The World series asks young entrepreneurs to share their definitions of success, desired impact on the world and share their single most important lesson. My goal with this series is to inspire young leaders and entrepreneurs to take action. Be bold. Go after your dreams. Make a positive change in the world. Every Monday, I'll feature a new guest and their story. Have someone you'd love to see featured or have suggestions on questions I should ask? Send me an email.